Ever wondered how twenty dollars can make a difference? In 1994, I mailed my first twenty dollar check to Fr. Flanagan’s Boys Town, in Nebraska. Every now and then, I receive letters from this non-profit organization, with a “Thank You” card to acknowledge the amount I sent. I felt good every time I read an enclosed success story of a young boy or girl whose life was changed, from being an unfortunate “street kid” abandoned and abused, and now living a good decent life and facing a bright future. 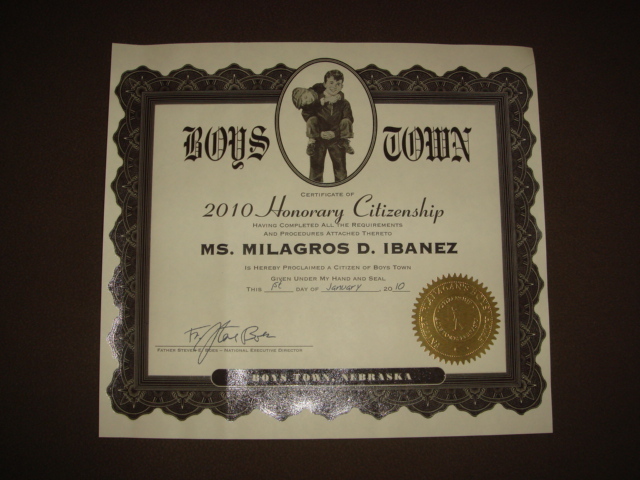 Being named as an Honorary Citizen of Boys Town, and although I have not been there, I felt a strong bond connecting me with these children. A meager amount I had been sharing, is nothing compared to the hard work and dedication of Fr. Flanagan since 1917, and when he died in 1948, his successors continued his legacy. “He ain’t heavy, he’s my brother”: the motto of Boys Town, depicts a picture of love, caring, and responsibility. That, if we help one child in need, it makes a big difference in his/her life… and ours. One week ago, very early in the morning, together with my friends Marie and Brenda, we took the long stretch of highway going to the central valley in Northern California. Meeting with the other volunteers from Kaiser Permanente, we will be a group to participate in providing outreach services to the residents of Sanger City, in Fresno County. Marie was so nice to drive us there. While the music of Journey kept us awake, the three hours of travel was enjoyable. When the scenery in Interstate 152 changed from mountain ranges to a vast, flat farm land, we knew, we were approaching our destination. Thanks to Brenda’s ever-faithful driving companion: Magellan, the GPS Navigator, for directing and re-directing us to the right way. The event was set up in the park. Though is was a sunny and warm day, we did not feel the heat because it was neutralized by the gentle breeze. Benches and tables were arranged under the shade of big trees. It was a festive event, enhanced by the music with a Mexican cumbia beat. Volunteers from both government and private sectors mingle with the residents. Raj, our event coordinator, was busy directing the flow of the group’s activities. Although all of us were nurses, we still took part in sorting and packing food stuffs, to be distributed. Our group, all Filipino nurses from San Francisco Bay Area, brought out that distinct Pinoy spirit of “Balikatan”. The residents of Sanger City, mostly farm workers, take pride in what they do. Every time I hold their hands and prick those calloused fingers with a lancet while doing a diabetic screening, I could not help but admire them. Yes, we are nurses who take care of the sick, but these people are the ones who farm to provide us with food. It is indeed a fact, that we are all inter-dependent with each other. Tired and weary, we headed back home. The long drive even made us more physically exhausted, but in our hearts, we carry and hold on, that energized feeling of self-fulfillment. We reached out, and touched the hearts our fellowmen.